Combination Insoles Protects The Metatarsal Areas. The 2-in-1 solution, these ¾ length insoles offer enhanced protection and support to the metatarsal and arch areas of the foot for improved underfoot comfort. 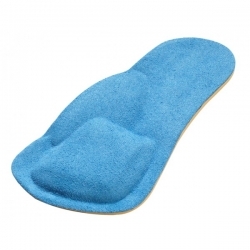 The combination insoles are made from PORON which has excellent shock absorbing properties and are specially designed to fit into Cosyfeet extra roomy footwear.